This practical book presents fundamental concepts and issues in computer modeling and simulation (M&S) in a simple and practical way for engineers, scientists, and managers who wish to apply simulation successfully to their real-world problems. It offers a concise approach to the coverage of generic (tool-independent) M&S concepts and enables engineering practitioners to easily learn, evaluate, and apply various available simulation concepts. Worked out examples are included to illustrate the concepts and an example modeling application is continued throughout the chapters to demonstrate the techniques. The book discusses modeling purposes, scoping a model, levels of modeling abstraction, the benefits and cost of including randomness, types of simulation, and statistical techniques. 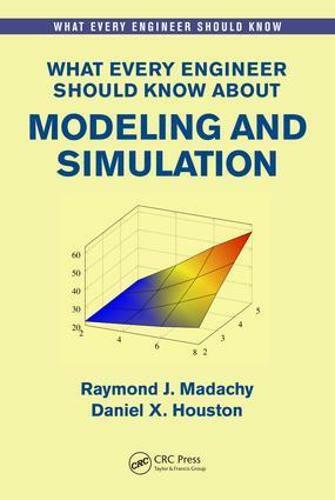 It also includes a chapter on modeling and simulation projects and how to conduct them for customer and engineer benefit and covers the stages of a modeling and simulation study, including process and system investigation, data collection, modeling scoping and production, model verification and validation, experimentation, and analysis of results. "The focus on broadness, simplicity and targeting the non-practitioner audience is the main reason for this book in my opinion. While this book is not targeted to experienced practitioners, the author's description of the modeling and simulation method in Chapter 2, along with descriptions of lessons they have learned, is a worthy read for novices and experts alike. Take advantage of the concise wisdom and insight offered herein." "...an excellent undergraduate introduction to M&S concepts that are truly relevant and useful in any and all engineering subdisciplines. The presentation is largely independent of both software and application domains, and yet still manages to communicate and explain a way to approach the use of simulation tools for decision support and systems analysis."